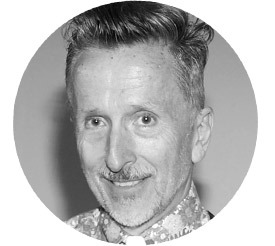 Simon Doonan is a memoirist and fashion commentator who began his career dressing windows, first for Aquascutum in London and then at Maxfield’s in Los Angeles. After advising on the design of the film Beverly Hills Cop, he moved to New York to further his career at Barneys and is currently serving as their Brand Ambassador at Large. He writes for Slate and has also written for the New York Times and the Observer. His books include Wacky Chicks: Life Lessons From Fearlessly Inappropriate and Fabulously Eccentric Women; Nasty: My Family and Other Glamorous Varmints; Gay Men Don’t Get Fat; and The Asylum: True Tales of Madness From a Life in Fashion. Simon lives in New York with his husband, designer Jonathan Adler.